The Health Sciences Library provides digital health services to the UNC community to support innovative research, education, and clinical care. We support the use of hardware, software, and data to improve health. The Health Sciences Library gratefully acknowledges a 2016 Innovation Award from UNC’s Center for Health Innovation, which supported our initial pilot work via the Carolina Digital Health Research Initiative (CaDHRI) in digital health. 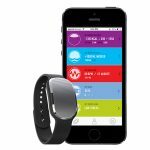 We have the world’s first and foremost collection of digital health devices available for checkout! The collection includes devices that track activity, posture, breath, vitals, vision, sleep, air quality, and more. The Health Sciences Library partners on research projects using Augmented Reality/Virtual Reality (AR/VR). 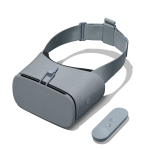 We also offer consultations and demonstrations of AR/VR and their use in health education, research, and clinical care. We offer consultations with researchers, faculty, and staff who are interested in using apps or devices in their work. If you’d like to set up a meeting, please email digitalhealth@unc.edu. Throughout the year we hold a series of events and workshops related to digital health. You can learn about upcoming events by joining the Digital Health @ HSL listserv. Also, check out our list of past events and the Digital Health YouTube playlist for videos of past digital health speakers. View our biweekly newsletter. 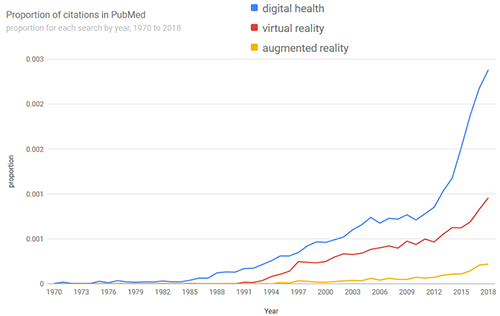 Graph showing the growth of digital health, virtual reality, and augmented reality articles published in PubMed since 1970. Made with PubMed by Year: http://esperr.github.io/pubmed-by-year. We define digital health as including mHealth (mobile health applications), wearable devices, wireless health, sensors, digital medical devices, connected health solutions, and self-tracking systems. Digital health is closely connected to personalized medicine, e-patients (electronically engaged patients), the use of personal health records, electronic medical records, big data in healthcare, and gamification.